EASTENDERS actress Anna Wing was just one of the faces at In Touch’s swinging new year’s ­party yesterday (Wednesday) at the Marriott Hotel in Kilburn. In Touch, the telephone befriending service for the elderly, which has 130 members, will celebrate its 10th anniversary next year. Last year it received council funds of around £50,000. 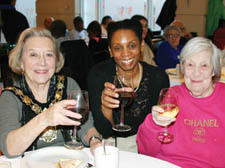 Ms Wing, from Soho, said staying “in touch” was very important for older people. “You do have to be very careful when you’re old,” she said. One of the benefits for members of the service is regular contact, according to Joy Fraser, an In Touch co-ordinator. She described how one service user was rescued by a phone call from a volunteer after she fell over. “If we hadn’t phoned her she would have been on the floor for another 24 hours,” she said. “A lot of our members just speak on the phone and don’t see each other – today really brings the service to life,” she added.